InterContinental Hotels Group (IHG) today announced the opening of a new 197-room Crowne Plaza Vientiane in Laos, marking the group's entry into the country. The hotel is ideal for meetings and events with modern meeting facilities including a ballroom and six fully-equipped meeting spaces that can be tailored to suit various needs. As part of the Crowne Plaza brand's signature meetings programme, there is also a dedicated Crowne Meetings Team and Crowne Meetings Director on site to ensure each event runs from start to end seamlessly. Travellers visiting Laos on leisure will find the hotel a convenient base from which to explore Vientiane – from the historical King Fa Ngum statue directly across the road to the vibrant local markets and cultural attractions located close by such as the colonial-style Lao National Museum, the bustling Vientiane Night Market and the famous Wat Si Muang temple. Leanne Harwood, Vice President, Operations, IHG, South East Asia and Korea said: "We are delighted to celebrate the opening of our first hotel in Laos with the launch of Crowne Plaza Vientiane. As one of the region's fastest growing nations, Laos has enjoyed significant economic growth in the last decade due to its expanding infrastructure which has played no small role in boosting tourism and attracting foreign investment into the country." "As part of our growth strategy we are constantly looking for quality growth in new markets, and with our first hotel in Laos now open and an optimistic tourism outlook projecting the arrival of over nine million foreign visitors by 2025, we are in a great position to cater to the growing number of travellers into the nation's capital," Leanne added. Crowne Plaza Vientiane features well-appointed premium guest rooms and suites tastefully decorated with traditional Lao elements, modern amenities and a variety of restaurants and bars for a range of dining experiences. Guests and locals alike can connect with friends or colleagues at the hotel's market style restaurant Mosaic or 3 Merchants, Vientiane's first Indochine restaurant offering a delectable mix of Lao, Thai, and Vietnamese cuisine. After a day out, guests can unwind with cocktails at the hotel's lounge bar, Elephant Lounge; or head to the outdoor beer garden to enjoy a casual evening in an al fresco setting. During their downtime, guests can take a dip in the hotel's outdoor infinity pool which offers stunning views of the city as they enjoy the poolside bar service at Splash; or re-energise with a workout at the 24-hour fitness centre boasting state-of-the-art equipment. For a restorative experience, the Senses Spa offers a range of relaxing treatments to help guests wind down after a long day. The hotel also provides complimentary high-speed Wi-Fi access for guests to stay connected, as well as Vientiane's first and only executive club lounge, offering exclusive services and special privileges to guests. Oliver Horn, General Manager, Crowne Plaza Vientiane, said: "Laos is gaining popularity as a tourism destination, and as the first internationally branded upscale hotel to open in the capital, we are in a great position to cater to visitors looking for quality accommodation whilst they're here on business or leisure. 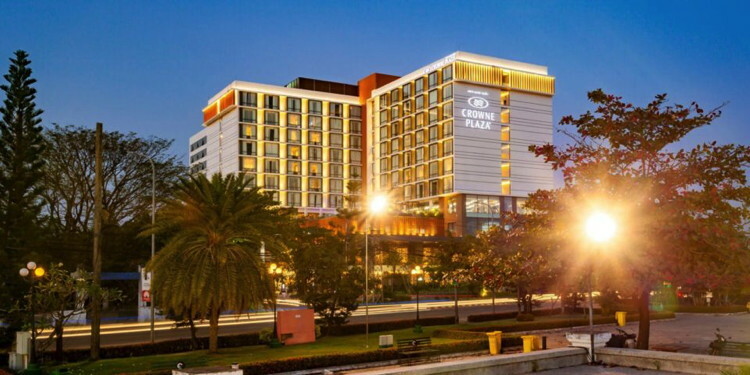 As one of the fastest growing hotel brands in the sector, Crowne Plaza is a trusted name all over the world and we are confident that the great experience our guests associate with the brand will set Crowne Plaza Vientiane apart and draw travellers to stay with us when they visit Vientiane." Are you with Crowne Plaza? If you are a member of Crowne Plaza you may be interested in learning how to optimize your content on our network.